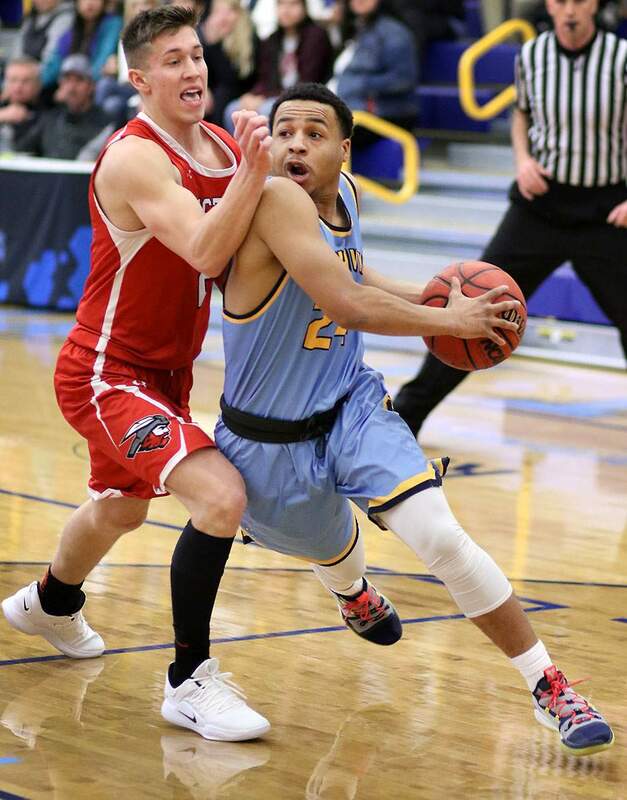 Despite laboring through pain, Marquel Beasley of Fort Lewis College played strong inside and scored a game-high 22 points Friday night at home against Western Colorado University. AJ Sparks of Fort Lewis College drives past a Western Colorado University player on Friday night at FLC. Western Colorado University stormed out to an early 19-6 lead. Fort Lewis College men’s basketball head coach Bob Pietrack called a timeout and told his team they weren’t playing hard enough. The Skyhawks responded. 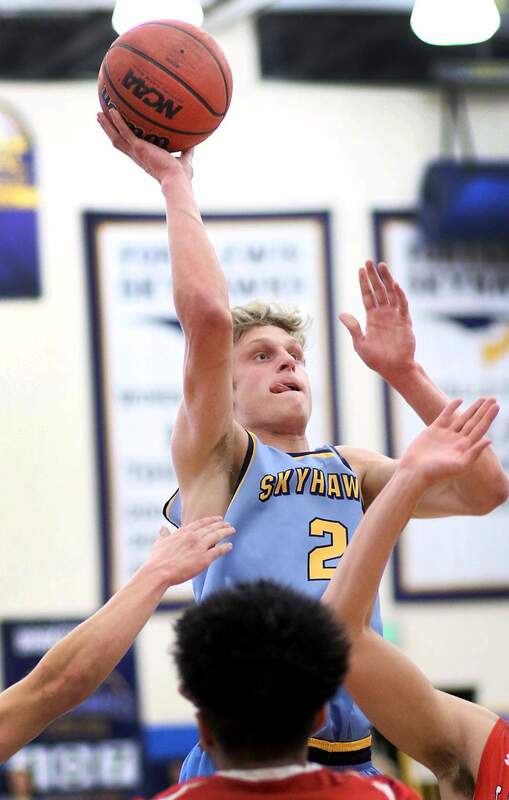 FLC erased the deficit and took a 26-24 lead with 6 minutes, 30 seconds to go in the first half when Ignacio High alum Wyatt Hayes stole the ball and ran up the floor for a fastbreak layup. FLC would take a 35-34 lead into the locker room at halftime. 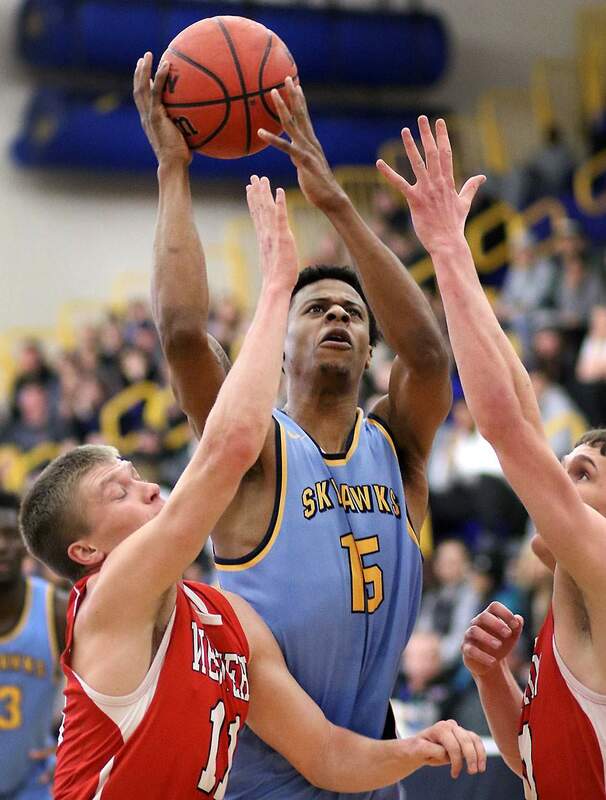 Monroe Porter would make two big 3-point shots early in the second half to reclaim the lead, but it was the heart of Fort Lewis College seniors Marquel Beasley, Otas Iyekekpolor and Alex Semadeni that sent the Skyhawks to a 72-63 victory Friday night inside Whalen Gymnasium. The win snapped a rare four-game home losing streak in Rocky Mountain Athletic Conference play for FLC. “Western, we’re playing a rival tonight, and we knew we’d get their best shot, especially early,” Pietrack said. “Any win feels great. We do it for a lot of different reasons, but players and coaches want to taste some success. Otas Iyekekpolor of Fort Lewis College goes in under the basket against Western Colorado University on Friday night at FLC. Beasley labored up and down the floor with a lower leg injury that has hindered him for weeks. But the senior forward from Illinois rose to the occasion whenever he was called on. He finished with a game-high 22 points. It was free throws from Iyekekpolor that tied the game at 44-44 with 14:41 to play. Semadeni then made a 3, and FLC (8-8, 3-7 RMAC) never relinquished a lead from there. FLC had a 52-44 lead when Iyekekpolor and junior guard A.J. Sparks had a heated exchange on the floor. Pietrack called a timeout, but the argument spilled over to the FLC bench. It was Beasley who calmed down both of the competitive players. After the timeout, Beasley scored nine of the team’s next 10 points, as he put the team on his back on both ends of the floor. Semadeni then followed with a key layup and forced a Western turnover on the defensive end. Out of a media timeout, Semadeni scored on another layup, and FLC was able to hold on to the win from there. Semadeni finished with 10 points, a team-high eight rebounds, three steals and two assists. Alex Semadeni of Fort Lewis College puts up a shot against Western Colorado University on Friday night at FLC. Iyekekpolor helped FLC steal momentum in the first half when he rebounded a missed Beasley free-throw and slammed home a dunk. In the second half, he put an exclamation point on the win when he rebounded a missed Beasley shot and put back a two-hand dunk over two defenders. 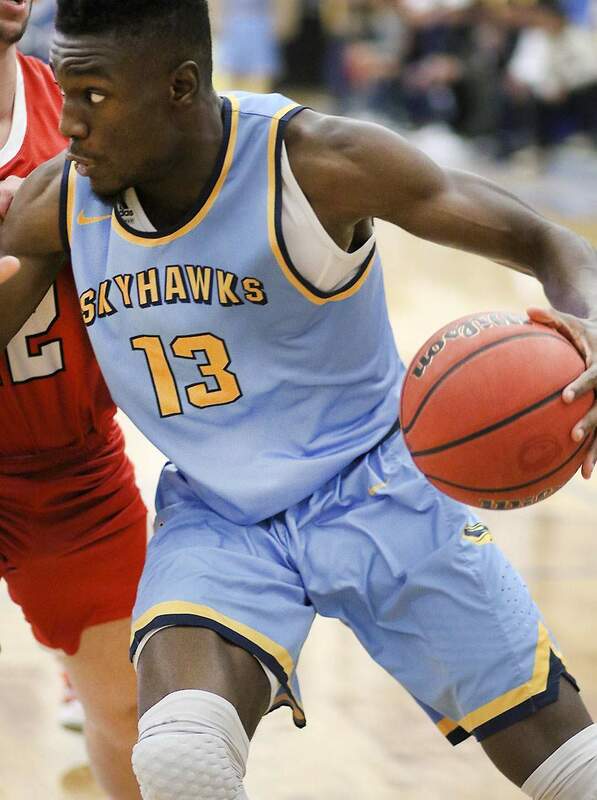 Iyekekpolor, a senior transfer, finished with 18 points and seven rebounds in his best conference game in an FLC jersey. Sparks added 11 points for FLC. Porter led Western (3-13, 0-10 RMAC) with 16 points and 10 rebounds, while Jordan Ticeson had 14 off the bench. Western shot only 35 percent in the game, while FLC shot 48 percent. Next up for FLC is rival Colorado Mesa University (12-4, 7-3 RMAC), which beat Adams State 79-74 on Friday night in Alamosa.